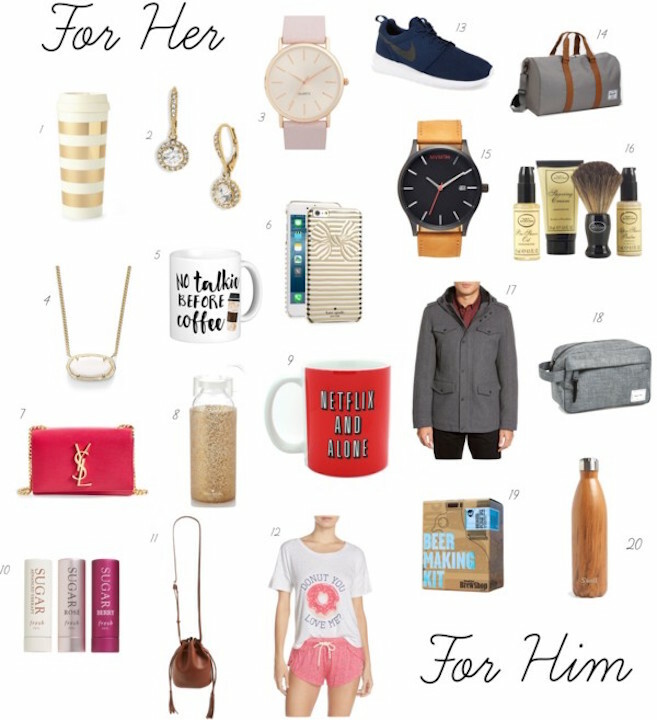 I pulled together some fun things that caught my eye would be perfect for him, her, your bestie, your momma, or yourself! Anyone you wanna show a little extra on this coming Valentine’s Day. The prices range from super affordable to you must really love this person/yourself, so take your pick or get a little bit of last minute inspiration! You can even mix and match some gifts to make a little basket or gift set of your own! 6. Kate Spade New York ‘Bow Stripe’ iPhone 6 $ 6s Case – 40% off and so cute to match with the Striped Thermal Mug! 7. Saint Laurent ‘Mini Monogram’ Crossbody Bag – Comes in classic black, too! 9. ‘Netflix and Alone’ Coffee Mug – How great is this mug? 11. Street Level Mini Faux Leather Tassel Bucket Bag – So cute and comes in black! 12. Honeydew Intimates ‘Sleep All Day’ Pajamas – Pajamas are always a great gift idea for your bestie! 17. Black Rivet Wool Blend Hooded Military Jacket – 50% off! 18. Herschel Supply Co. ‘Chapter’ Travel Kit – Perfect match with the Herschel duffel bag! 20. S’well ‘Wood Collection – Teakwood’ Stainless Steal Water Bottle – Comes in a bunch for different colors but this Teakwood is so nice for him or her!